A NEW FULL-BODY shot of Adrien Broner training shows the four-time world titlist trim, visibly in great shape. He glows like a bronze statue. It’s a big difference, an incredible leap from a previous shot of Broner last month that showed a loose mid-section and fatty stomach. On the other hand, Manny Pacquiao, who defends his WBA welterweight crown against Broner in Las Vegas on Jan. 19, did not have to pose and bare his superb fighting form. Instead, his pictures in training at the Wild Card Gym showed Pacquiao perfecting a well-rounded artillery, with clear emphasis on digging hard and damning the opponent’s body, mainly the rib cage and liver area. There’s relative silence on the Broner side, unlike the first time the controversial untamed warrior from Cincinnati told Pacquiao in their initial face-off in New York that he would be out to dismantle the legendary Filipino boxing superstar. Pacquiao laughed off that Broner taunt, made at the start of the media tour promoting the Jan. 19 championship. Pacquiao calmly countered that Broner, who also claimed he loved to feast of southpaws, is a born comedian. Broner can only be expected to push harder to be truly fit and tough as he now looks. Not Pacquiao. The lone eight-division world title winner has, in fact, started tapering off, doing easy and lighter regimen ahead of the long drive to Las Vegas on Saturday. Time is of the essence for Broner who unfortunately has been caught in serious legal bind. He was scheduled to attend two separate court hearings for sexual harassment on Jan. 7, while a third court appearance awaits on Jan. 23, four days after his title fight against Pacquiao. Without being asked, Pacquiao openly declared that he would go for knockout come Jan. 19. Call it new-found hunger, but his appetite for a stoppage has obviously been sharpened following his seventh-round TKO of Argentine Lucas Matthysse in Kuala Lumpur last July. 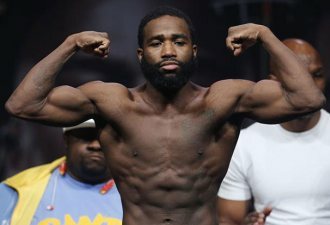 Broner is reputed to own a tough steely chin. But chief trainer Buboy Fernandez said Pacquiao would work to break down the body. If Broner opts to slug it out, Manny would bang him, Buboy said, if Broner dances and runs, he would be chased any which way he goes. There seems no way out, but Broner’s handlers, led by trainer Kevin Cunningham, may still have a chance to plot one last escape --something incredible as a knockout!